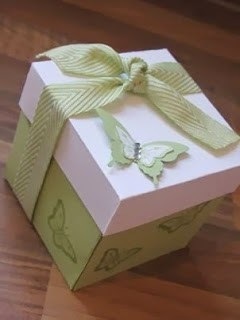 This is a box I first made over a year ago but have remade many times as I really do think it is a gorgeous, elegant box that really gives a wow factor to gifts. Hope you all agree. I had to make a few more recently as a friend wanted to make some for a butterfly themed baby shower so I thought I would made a little video at the same time. 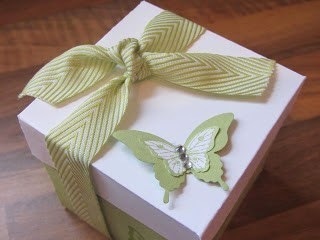 I LOVE the Chevron Ribbon from SU, if you regularly read my blog you will know I use it a lot! I was pretty disappointed to see it on the retiring list - but that just means a good reason to stock up at a great price doesn't it? 18cm by 18cm, score at 6cm on all sides.